The field of long-term care is experiencing significant growth and near-constant change. Older adults and people with disabilities today make up a larger segment of society than ever before, and with this shift in demographics comes an increased demand for long-term services and supports. Technological advancements and evolving consumer preferences are reshaping the services that people want and need, and new models of care reflect a shift in emphasis from institutional to community-based settings. The Affordable Care Act (ACA) and other reform efforts have introduced new regulations, requirements, and pressures for long-term care providers; however, they have also brought new opportunities. 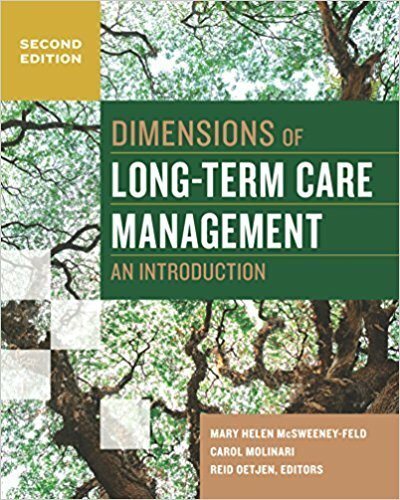 This introductory book examines the various dimensions of long-term care and explores the facets of management essential to success in this rapidly changing environment. The first part of the book provides an overview of key definitions, settings, policy issues, and trends in the delivery of long-term services and supports. The second part relates aspects of management including leadership, human resources, marketing, facility management, regulatory and legal issues, and financing to long-term care. Significantly revised and updated, this edition includes four new chapters, addressing the following topics: Delivery of long-term services and supports under the ACA; Transitions between acute care, residential long-term care, and home and community-based care settings; The implications of global trends in long-term care policies and services; Quality improvement tools and reform-driven requirements for safety and transparency Additional updates for this edition focus on specialized care for individuals with chronic and disabling conditions, new technologies that maintain patients health information and enhance communication, and the challenges in assembling and retaining an effective direct care workforce. 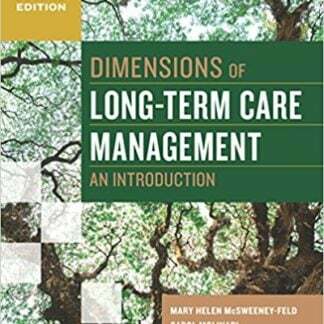 Dimensions of Long-Term Care Management An Introduction Second Edition: The field of long-term care is experiencing significant growth and near-constant change. Older adults and people with disabilities today make up a larger segment of society than ever before, and with this shift in demographics comes an increased demand for long-term services and supports. Technological advancements and evolving consumer preferences are reshaping the services that people want and need, and new models of care reflect a shift in emphasis from institutional to community-based settings. The Affordable Care Act (ACA) and other reform efforts have introduced new regulations, requirements, and pressures for long-term care providers; however, they have also brought new opportunities. This introductory book examines the various dimensions of long-term care and explores the facets of management essential to success in this rapidly changing environment. The first part of the book provides an overview of key definitions, settings, policy issues, and trends in the delivery of long-term services and supports. The second part relates aspects of management including leadership, human resources, marketing, facility management, regulatory and legal issues, and financing to long-term care. Significantly revised and updated, this edition includes four new chapters, addressing the following topics: Delivery of long-term services and supports under the ACA; Transitions between acute care, residential long-term care, and home and community-based care settings; The implications of global trends in long-term care policies and services; Quality improvement tools and reform-driven requirements for safety and transparency Additional updates for this edition focus on specialized care for individuals with chronic and disabling conditions, new technologies that maintain patients health information and enhance communication, and the challenges in assembling and retaining an effective direct care workforce.